It wasn’t a pretty win for the Leafs on Wednesday night at Air Canada Centre. But in sports, what matters isn’t “how”, but “how many”. Frederik Andersen made 47 saves as Toronto prevailed 2-1 in a shootout over Calgary, defeating the Flames for the second time in as many weeks. Calgary struck first blood in the opening period on a power play. With Matt Martin in the penalty box, defenceman Mark Giordano fired a shot from the left point that eluded a maze of players for his fourth goal of the year. Tempers flared when a scrum ensued in front of the Flames bench after William Nylander slashed Matt Stajan in the Flames’ zone, on an unpenalized play. During the melee, Matthew Tkachuk appeared to spear Martin from his spot on the bench, but the jab went undetected by the officials. 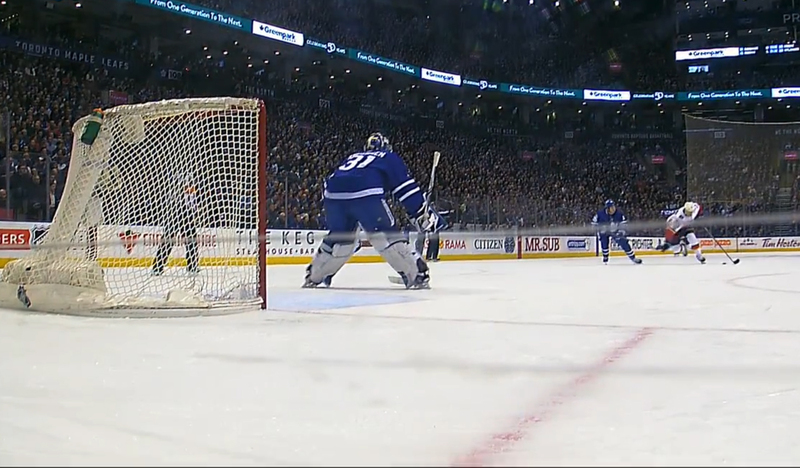 Moments later, Morgan Rielly equaled the score with an apparent harmless-looking shot from the side boards, just outside the faceoff circle. The teams remained deadlocked after regulation time, setting the stage for a heart-stopping overtime session, somewhat compensating for what had been a lacklustre three periods of hockey. Johnny Gaudreau had a chance to claim victory for the Flames, but his scoring chance generated after some crafty manoeuvring in the Leafs zone was turned away by Andersen. At the other end of the rink, Austom Matthews appeared to have the game on his stick, only to miss what looked like a tap-in game-winner. The ensuing shootout went to overtime, and in the fourth round, William Nylander – with a backhand move that got the better of Flames goalie Mike Smith – prevailed as the hero.